I am so happy, my heart is so full, I can’t sit still. I can’t concentrate. I can’t believe I’m doing the very things I have been longing to do – in Egypt. My gifts are being used, just like the broken parts of the wheelchairs I see piled up in the parking lot. And I’m learning to value them. In Germany I have often thought being an English teacher to be beneath my level of intelligence. Not only is my life as an English teacher reductive, I keep getting the lowest level students, reducing my vocabulary still further! My once vast vocabulary has been reduced to a few hundred words. When I speak to native speakers of English, I think I must sound like a simpleton, my English has become so basic. But here in Egypt, that is exactly what they need. This morning, a new thought emerges. It is so beautiful and new, I think it is God speaking to me: “These are my beloved children. I am so pleased that you are open to them, I am opening your heart up, just as you have asked me to do.” It is as though my openness to the poorest of the poor opens me. As I close myself to the weakest, the most broken, my heart closes in direct proportion. What an amazing principle. I have asked God to open me up more and more to God’s love. And it is happening. I tingle. My heart burns. The condition for receiving this love is to be open to all of God’s creation. Today is Friday, the Sabbath of the Muslims, and everything is closed. Most of the sisters are fasting, and there are no activities scheduled for today. 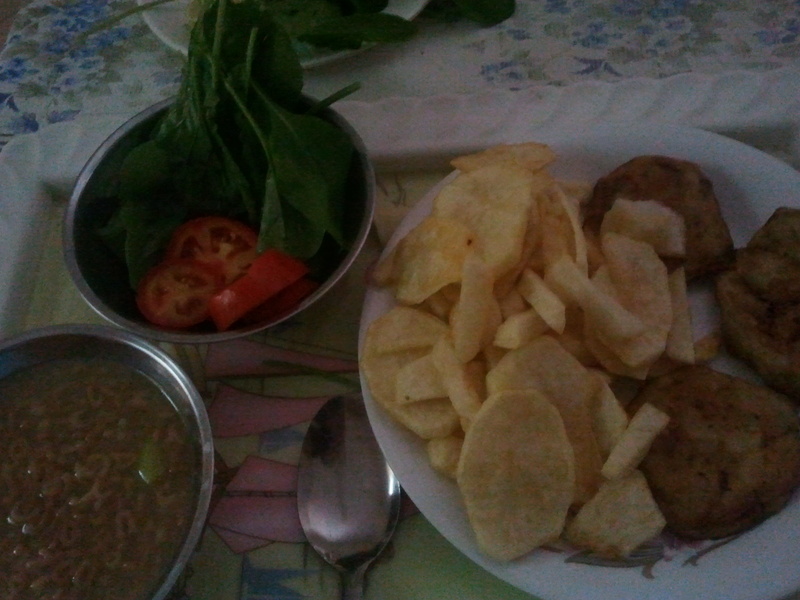 All I can report of this day thus far is that Sister Mariem has prepared a magnificent breakfast for me – breaded fried eggplant, French fries, noodle soup, tomato slices with rucola, and bread with molasses. 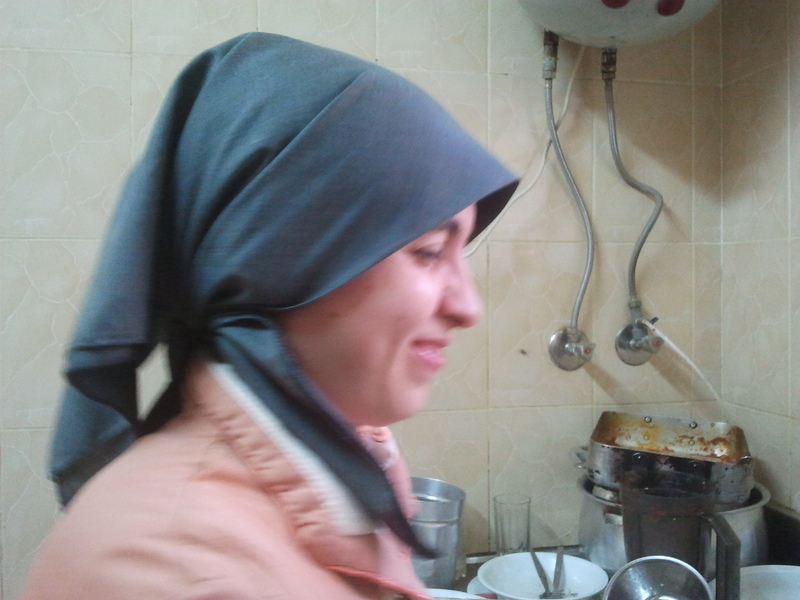 Sister Ologaya sits across from me, eating foul – cooked fava beans and pita bread, her favorite breakfast. Each day I am more impressed with these sisters and their work. I recall a Bible passage about the worth of a woman. In Proverbs 31:10 it says, “A wife of noble character who can find? She is worth far more than rubies.” These women are celibate, but I believe that in the Catholic Church, when a nun makes her vows, she becomes a bride of Christ. So, these Sisters are also, in a way, wives. They are beautiful gems, and I find them models of what I admire in a woman. I find myself calling them rubies – rubies who have chosen to live in the rubble near the rubbish heap. Sometimes I wander into the dining room and discover a sister or two working in the kitchen. They’re often humming pretty songs, which I assume are Egyptian songs worshipping God. One day when I was in the dining room I showed them that I had Egyptian worship music in my computer – music from a group called “Better Life“. “Oh, I know that group!” they all exclaimed. Since then, when I come into the dining room to check and write emails, they ask to hear the music, and then translate the lyrics for me. Sister Marina even owns the same CD as I, and Sister Elleria sings a song for me. What a beautiful voice she has, and how lovely these songs are. Each day they overturn assumptions I had made the day before. Now I know that the entry to the convent is filled with sand piles because they need the sand for laying the terracotta tiles. There are plans to turn the garden I thought was so messy into a little paradise. Parts that look as though they are randomly lying around, are actually there for a reason. The washing machine I thought had been discarded into and defacing the garden was placed there because it is next to where the handicapped children live. These children are helping to load trucks with things like the washing machine, as well as the wheel chairs now sitting in the parking lot, for repairs. They are helping load lumber and furniture onto trucks for delivery to a new school/dormitory the Salam center is opening. Nothing is wasted here – not the gifts of the handicapped children, and not the leftovers from the meals. Sister Mariem’s dog gets all the chicken bones. I thought dogs couldn’t eat chicken bones, but this dog does, and is not harmed. It seems I am not harmed from the food either. I tried a little rucola the other day, and my stools were fine afterward, so I’ve been increasing my intake of raw vegetables. I’m still in the best of health. At breakfast I look at all the food in the garbage and ask if this is for compost. No, it’s for the chickens. You have chickens here? I ask. Oh, yes, they’re Sister Mariem’s chickens. I ask to see them. 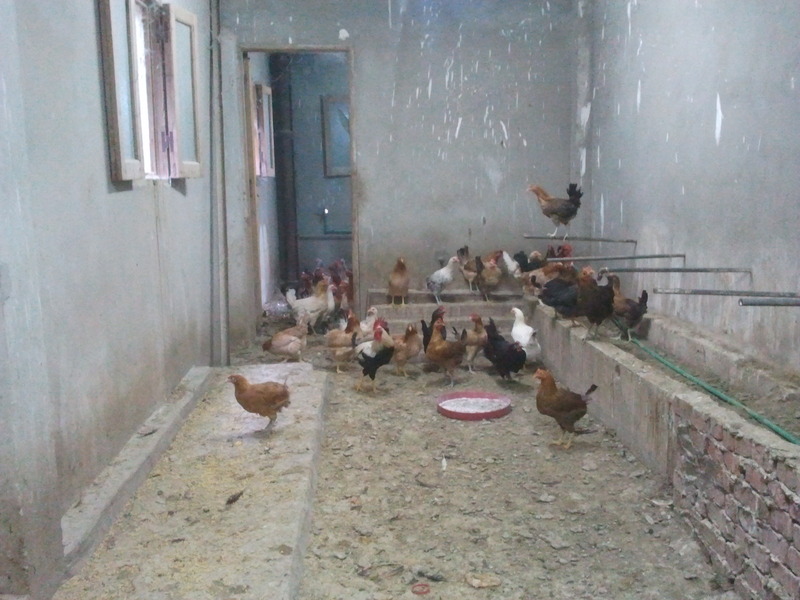 I am ushered outside to a dilapidated building, where the chickens are kept. We have delicious eggs nearly every day here. Turns out these eggs are from Sister Mariem’s chickens. 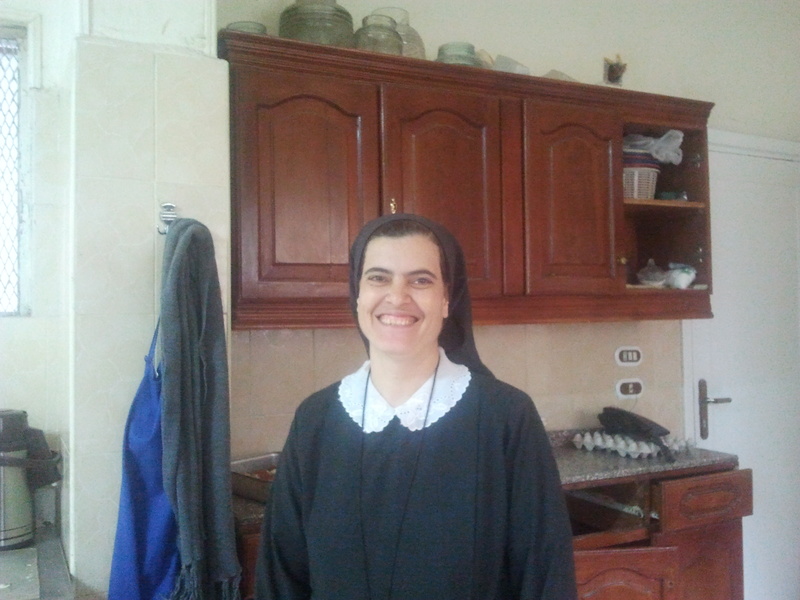 So I ask Sister Mariem, whose English is the best of anyone’s here, if the garden is organic. “Oh, yes,” she answers. “We don’t use any chemical fertilizer on the garden.” I found out that the tap water is safe, just unpalatable. So the food here is also safe for Westerners to eat. One day Sister Ologaya shows me the garden. We discuss the names for herbs and vegetables. Sometimes her English fails her, and she resorts to French. Either way, I’m learning so many new words for these things, I can’t keep track of them all, although I write down and practice new words every day. Green beans, fava beans, lettuce, cabbage, rucola, molokhaya (the vegetable that tastes like slimy spinach), mint, sage, onions, mango, date and orange trees, and more. She leads me to a stall, where I discover a beautiful young cow and a goat. They plan to inseminate them so that next year they can have their own fresh milk. Knowing the sisters, they’ll probably find a nice male cow somewhere and put the two cows together. The cats have the run of the garden. My first day I discovered a cat resting on one of the chairs in the dining room. I love this place that converts old apartments into chicken stalls, old hospitals into schools, and lets cats run around the dining room. I find myself, for the first time, wholeheartedly accepting a Christian community. I feel like I belong here, and that I want to belong to these women who are so full of love and joy.